NASA has finally revived its most powerful Mars orbiter fromits months-long slumber due to a computer glitch. The spacecraft, NASA?s MarsReconnaissance Orbiter, slipped into a protective ?safe mode? in lateAugust, stalling its science observations but safeguarding the $720 millionprobe from further damage. Instead of rousing the orbiter within a few days, asin past glitches, NASA engineers spent months trying to find the source of theprobe?s inexplicable computerrebooting malfunctions. "The patient is out of danger, but more steps have tobe taken to get it back on its feet," said Jim Erickson, the spacecraft?sproject manager at NASA?s Jet Propulsion Laboratory (JPL) in Pasadena, Calif.
JPL engineers beamed the 4-year-old orbiter a vital softwareupgrade last week to patch a potentially mission-killing scenario in thespacecraft?s onboard computer. That scenario, the unlikely occurrence ofback-to-back computer reboots, could have sent the powerful Marsorbiter offline for good, mission managers said. The satellite?s resurrection began Nov. 30 with the softwareupdate, and new commands are being sent this week to check the spacecraft?sscience operations. Actual science observations may resume in earnest nextweek, mission managers said. Computer glitches have plagued the Mars ReconnaissanceOrbiter this year. In addition to the latest computer reboot in August, theprobe suffered similar malfunctions in February and June. Engineers initiallythought they were caused by cosmic rays or solar particles interfering with theprobe?s electronics. In August, the orbiter also unexpectedly switched to abackup computer, a different kind of malfunction, for a short while. The Mars Reconnaissance Orbiter is NASA?s youngestspacecraft orbiting the red planet and the most powerful probe ever to observethe Martian surface. The orbiter launched in 2005 and arrived at Mars in 2006.Since then, it has beamed more data and images of the planet to Earth than allother Mars missions in history combined. The spacecraft completed its primary mission in late 2008and is currently in the middle of an extended mission that runs throughmid-2010. 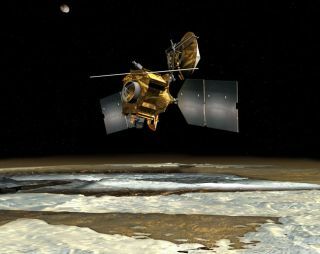 It is not the only Mars probe to encounter difficulties thisyear. NASA?s Mars roverSpirit has been stuck wheels-deep in Martian sand since April. Engineers atJPL have been trying several methods of extricating it, but have been waylaid bywheel stall and tilt issues.